I find there is a right way to do things and a wrong way. The wrong way is usually a lot faster and a lot less work, but when you do it that way, inevitably you realize the error of your way and find the need to do the same work over. Such was the case of some research that I was doing for my (former) step-daughter. I returned to her tree the other day and found a note I had made the last time I was researching her second great grandfather, William I. Middleton. It was questioning the validity of the couple I had established as his parents. I had been using Ancestry Web interface and allowed the sources and citations to be the easy attribution that Ancestry.Com provides. It is easy and nice but not as thorough as I like to document a person. When I ran into a problem suggesting different parents for William, I really couldn’t sort it out because the sources were all electronic and didn’t provide an easy way to see all of the data simultaneously. In other words, analysis was difficult, if not impossible. Admittedly, it was a lot easier to do the work the second time because Ancestry did provide links to the Ancestry provided Census and other documents. I then took that information, generated my own hand-written census sheets and printed out for my records all of the other documents, such as a copy of William’s WW1 Draft Registration. Then I gleaned all of the information out of the various documents that I could to provide a much better picture of William and his life. The bottom line is when you have a process that fully documents your facts and fully links those facts to the sources, don’t try to take shortcuts. Follow your process. William Isack Middleton was born on 17 Nov 1872, in New York, probably Kings County, to John Alexander and Mary Elizabeth (Collyer) Middleton. William had three siblings, a brother, Ferris J., who was 11 years older, a sister, Cora R., who was 9 years older, and another sibling whose age and relationship is unknown. The 1900 Census indicates that his mother had had four children, three of whom were still living. The family grew up in Brooklyn, Kings County, New York. 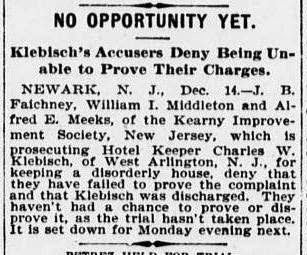 It appears that William moved to New Jersey before 1893 because he was he involved in prosecuting the owner of a disorderly house in December of 1893. He married Lillian Neilson Bailey on 2 September 1895, at Trinity Episcopal Church, Arlington, NJ. In February, 1900 Lillian gave birth to a son Stuart Rae Middleton. William was working as a millwright at a machine shop. Family tradition says Lillian gave birth to twins and that the other child died as an infant. The 1900 Census corroborates this by indicating that Lillian had had two children, only one of whom was living. The young couple was renting a home on Chestnut Street, Kearny, Hudson County, New Jersey next door to Lillian’s parents, William and Mary Bailey. By 1910 the family had purchased a home at 625 Chestnut Street. W hen he registered for the draft in 1918, the 45 year-old William was working as an “Erecting Engineer” for Permutit Company. Permutit was a pioneer in water and wastewater treatment technology and was acquired by United States Filter Corporation in 1993. William must have been prematurely gray as his physical description was Medium Height, Stout Build, Blue Eyes, Grey Hair. In 1919, his son Stuart married Lillian Wanding and the couple came to live with William, William’s wife (also named Lillian) and William’s mother-in-law, Mary (Russell) Bailey. 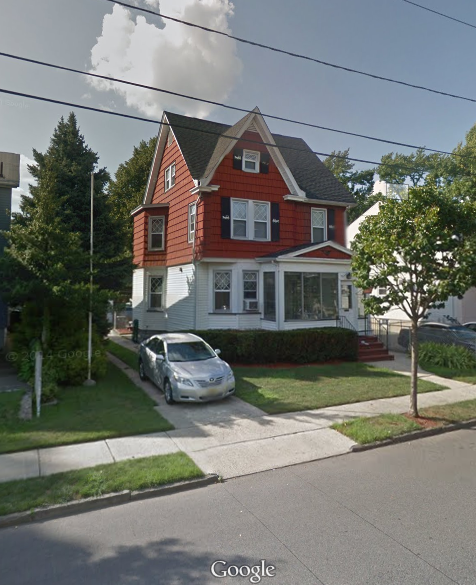 By 1930, the couple moved again, this time to a home on Spruce Ave. valued at $6500, in Lincoln Park, Morris County, New Jersey. In 1935 they were living someplace in a rural area of Morris County and in 1940 they had moved in with their son, Stuart, to a house on Grove Street in Boonton, Morris County, New Jersey. When or where William died or was buried is unknown. · Order copy of William and Lillian’s Marriage License. · Order copy of William’s birth record. · Find William’s death record. U.S., World War I Draft Registration Cards, 1917-1918, Ancestry.com, http://www.Ancestry.com, Registration: New Jersey; Hudson; Roll: 1712201; Draft Board: 5. William Isack Middleton. The Evening World, New Jersey 14 Dec 1893 – LAST EDITION, Page 3, Image 3. http://chroniclingamerica.loc.gov/lccn/sn83030193/1893-12-14/ed-3/seq-3/print/image_681x648_from_1718%2C3448_to_3150%2C4812/., online (http://chroniclingamerica.loc.gov). U.S., World War I Draft Registration Cards, 1917-1918, Ancestry.com, http://www.Ancestry.com, Database online. Registration Location: Hudson County, New Jersey; Roll: ; Draft Board:. Record for Stuart Rae Middleton. Trenton Evening Times (Trenton, NJ) – March, 28, 1929, Page 2 via www.genealogybank.com.